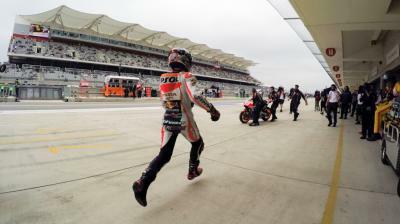 Repsol Honda’s Marc Marquez claimed his 23rd MotoGP™ pole position with an incredible final lap during a tense Q2 in Austin. 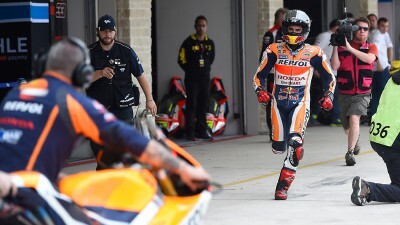 The lap was made even more remarkable by the fact the reigning MotoGP™ World Champion had to stop on track with 3 minutes remaining after a technical fault and run back down the pit lane to retrieve his second bike with just seconds to spare. 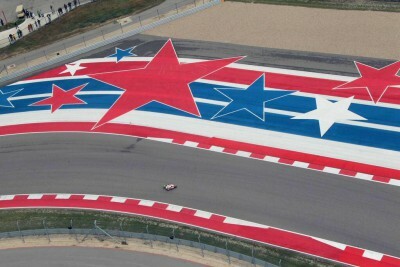 Not even this could stop the Spaniard as he went back out on track to set the fastest ever time on two-wheels around CoTA, a 2’02.135, over sixth-tenths quicker than his previous lap record set in Qualifying last year. It was a fitting end to a thrilling Q2, which saw the lead change hands a number of times in the dying seconds. 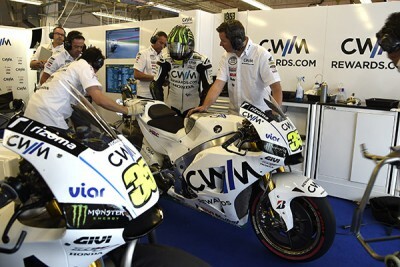 The leading Satellite rider was once again Cal Crutchlow (+0.478s) in 5th place on the CWM LCR Honda, who has impressed throughout the weekend. The British rider finished second fastest in FP3, and blames himself for missing out on the front row: "It is my own fault. I felt comfortable riding on my own but I just outbraked myself into turn 11, which is in the second sector and then I lost all the drive onto the straight, which is into the third sector. 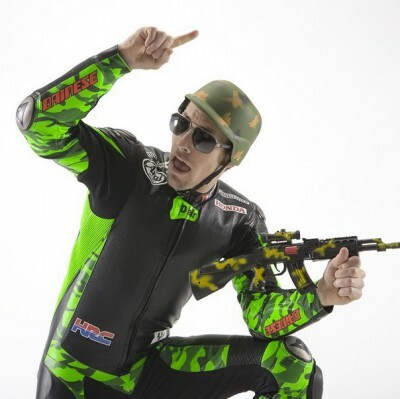 I wrecked two sectors basically and it definitely cost me the front row." Danilo Petrucci on the Pramac Racing Ducati and the second Team Suzuki Ecstar GSX-RR of Maverick Viñales will complete the 4th row on the grid for Sundays race. Earlier on, it was Andrea Iannone and Maverick Viñales who made it through from Q1. 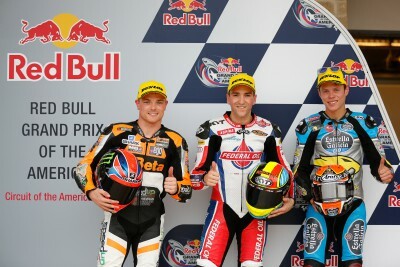 Hector Barbera missed out on taking part in Q2 by less than five-hundredths of a second, but won the battle of the Open class riders and will start from the front of the 5th row in 13th place, ahead of Athina Forward Racing’s Stefan Bradl and Yonny Hernandez on the second Pramac Racing Ducati. Click here for the full Qualifying results and starting grid for Sunday’s MotoGP™ race, which is due to start at 14:00 local time in Austin. 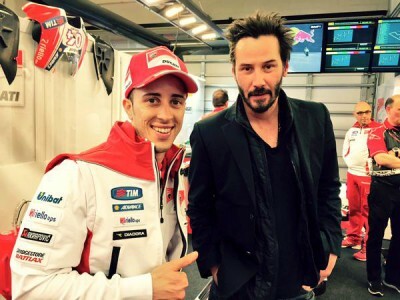 Austin provided some Hollywood glamour as Marc Marquez managed to claim his first victory of the season after a sensational pole lap. 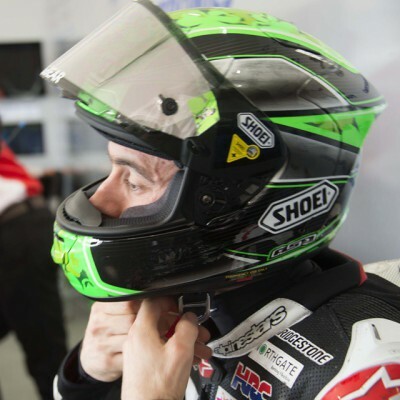 Eugene Laverty is looking forward to visiting the Circuito de Jerez, as he has won twice before at the Spanish track. 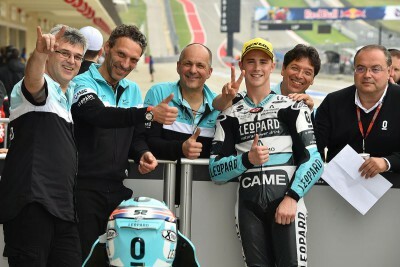 Kent: “It feels good to be back on pole"
Danny Kent was unstoppable today as he smashed the lap record at the Circuit of The Americas several times and stormed to pole position. 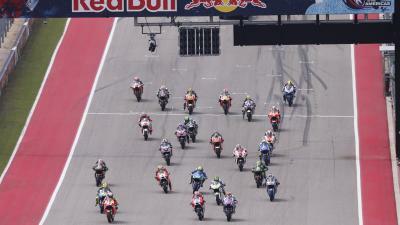 Experience a lap of the Circuit Of The Americas with motogp.com's Dylan Gray. 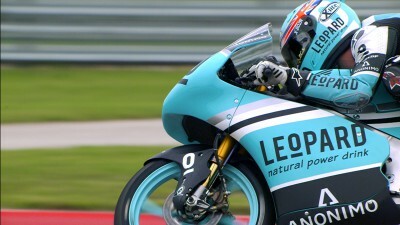 Brit Danny Kent claimed pole position for the Moto3™ race at COTA. 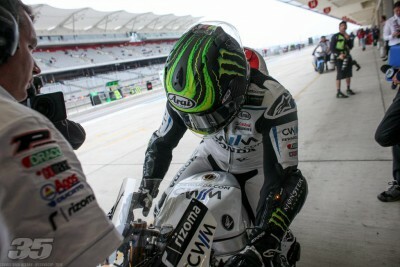 Crutchlow: “It is frustrating not to be on the front row"
CWM LCR Honda Team rider Cal Crutchlow will start from the second row of the grid after setting the fifth fastest time in Q2 at COTA. Sam Lowes just missed out on his second pole of the season after crashing out of Q2, but starts from the front row in 2nd place. 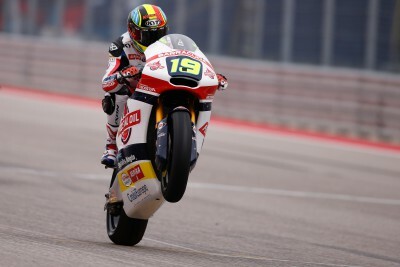 Federal Oil Gresini’s Xavier Simeon took his second Moto2™ pole position at the Red Bull Grand Prix of The Americas.